On December 11, 2018, First District Development Company (FDDC) hosted their Annual Celebration in conjunction with recognizing their 35th year anniversary of originating loans. During the event, FDDC thanked all of their lending partners throughout South Dakota who have joined them in providing financing to South Dakota’s small businesses. Also, during the event, FDDC recognized Paul Hinderaker for his 30 years of legal counsel provided to FDDC. 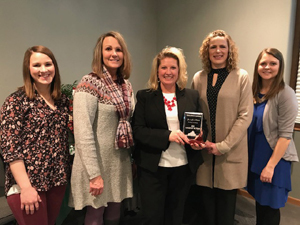 Finally, Jennifer Olson with MetaBank in Brookings, SD, was awarded with FDDC’s 2018 Lender of the Year Award. Jennifer Olson was chosen because of her dedication to small businesses, customer service, and creativity in commercial financing. Her continuous support of FDDC is very much appreciated. Above (from left): Andrea Tesch, Paula Hulscher (both with FDDC), Jennifer Olson (MetaBank in Brookings), Amy Waite, and Shelby Kraemer (both with FDDC). Right: Guests join FDDC for their 35th year ribbon cutting.